Food and beverage manufacturers today face a host of challenges— SKU proliferation, more frequent line changeovers, finding and retaining skilled employees — all while handling the day-to-day challenges of keeping the line running smoothly in the first place. 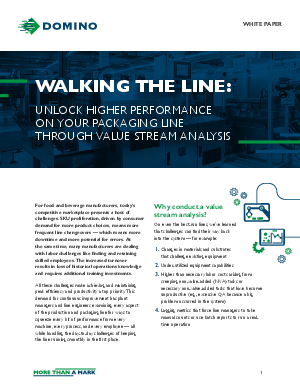 This white paper from Domino takes a look at how conducting a value stream analysis with a third-party provider can uncover a wide array of opportunities to improve productivity and efficiency. From freeing up labor and reducing errors to shortening changeover time and sharing critical operational knowledge among all stakeholders, a value stream analysis provides a collaborative opportunity to learn and discover new ways to boost productivity without major equipment investments.